PITTSBURGH, PA (November 18, 2015) – Howard Hanna Real Estate Services, the 4th largest real estate company in the U.S.A., introduces their new website to the public for the first time today. Working collaboratively with 1000Watt, the leading agency focused on real estate and mortgage branding, marketing and innovation, the new HowardHanna.com is widely regarded as the most powerful real estate site in the entire industry. HowardHanna.com achieves new milestones in real estate brokerage navigation by combining active listings, recent sales and public records data for properties within a clean, modern design that highlights the strength of the Howard Hanna brand. It is easy to navigate and provides the information and features that consumers love. The new HowardHanna.com offers consumers something they won’t find on any other website: the ability to get details on any property, whether it’s for sale, recently sold or off the market. By combining up-to-the-minute updates from over 30 MLSs with millions of public records, we can offer any consumer – buyer, seller, or a property owner thinking of selling, a complete picture of the housing market. 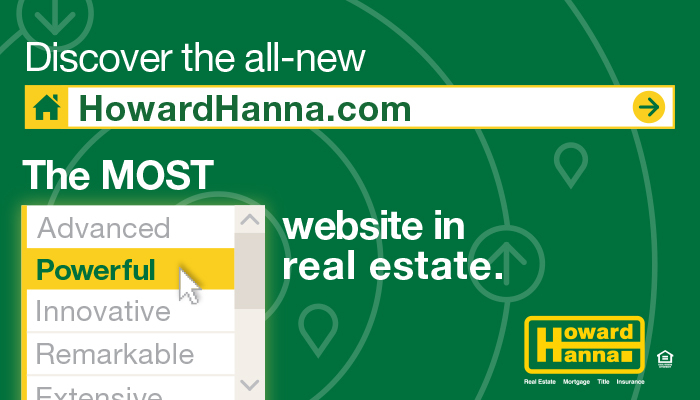 And by offering all of this information on our site, it gives Howard Hanna agents the opportunity to connect with prospects online in new ways. Studies show that consumers who are ‘thinking of selling’ often seek price histories and recent sales prices to gauge the market. They can now get this information at HowardHanna.com, along with clear calls to action to also get the expert assistance of a Howard Hanna agent. People don’t just buy homes, they buy a place to live their life. That means they want to see what a community or neighborhood is like before they make the commitment. The Hanna View feature gives them that by displaying current photos of the community surrounding every listing. Best of all, Howard Hanna agents can easily submit – and get credit for – community photos right from their mobile phones. This living database of neighborhood photos will give HowardHanna.com a richer experience for serious homebuyers. This translates into more traffic, more visits and more leads for Howard Hanna agents. This exclusive feature is aimed at sellers. By simply typing an address into the HowardHanna.com homepage, consumers will instantly receive a snapshot of market stats, active listings and recent sold prices around the property address that has been searched. We’ve even included two automated home value estimates so we can show not only a rough value range, but the broad disparity between computer generated values.